Beijing Day Trips organizes unique and exclusive day trips to sights in and around Beijing. 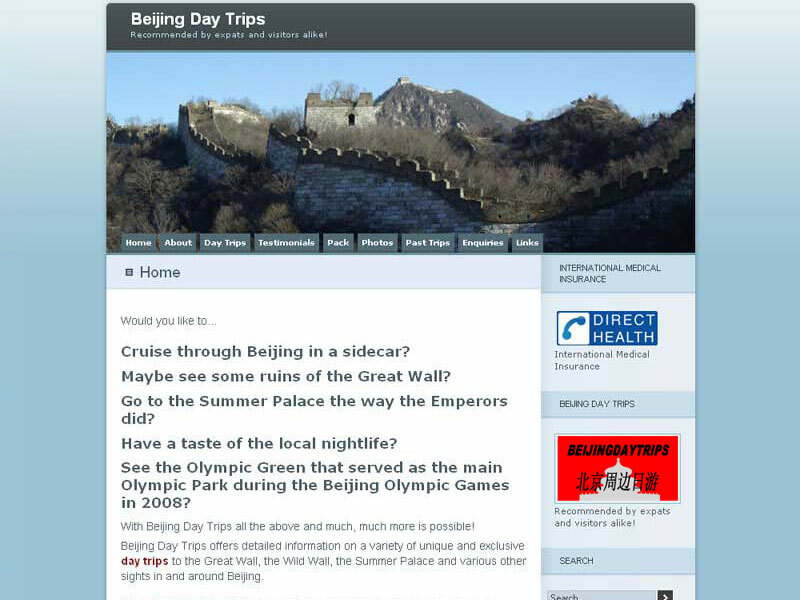 As Beijing Day Trips got busier with many advance reservations, we needed to redevelop the entire site, to be ready for the Beijing Olympic Games in 2008. Of course we used WordPress as CMS and we added a rotating header script to show different pictures of the wild Great Wall, the destination of most of our Beijing day trips. The site had an integrated calendar, so future clients could exactly see if we still had availability on their desired day. Furthermore we published photo albums of every day trip we did with our clients and we used different contact forms for different purposes. Because of the wide variety of trips, all with their own page, and the fact that we published all our upcoming trips as new WordPress Posts, the Beijing Day Trips website very quickly reached high Google rankings and top 3 search results for many targeted keywords.